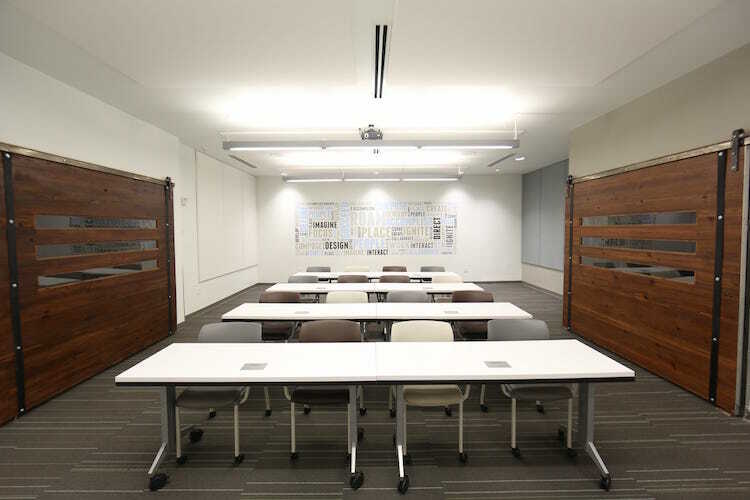 Windows overlooking the Dunwoody skyline and two retractable garage doors energize this meeting space. 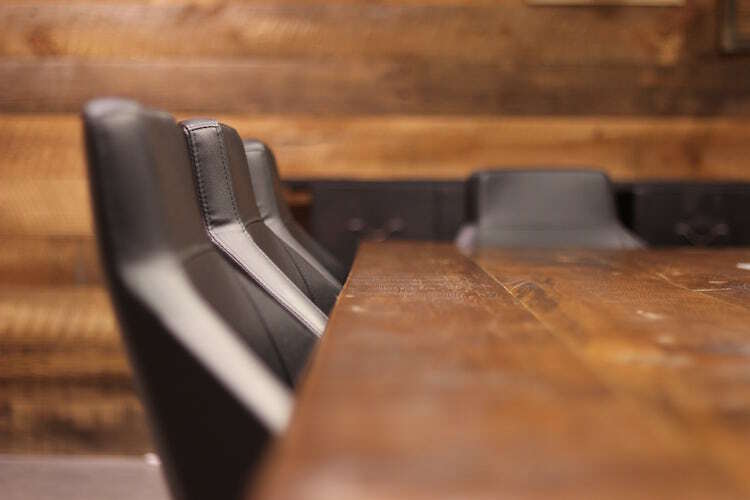 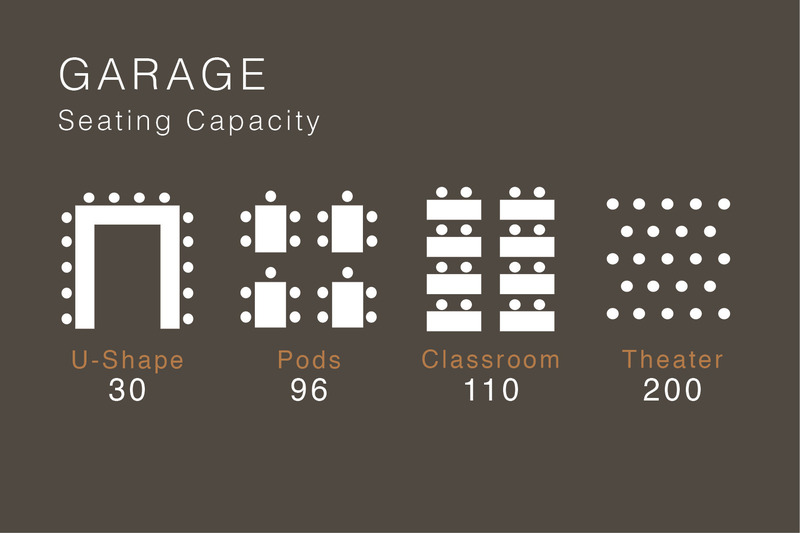 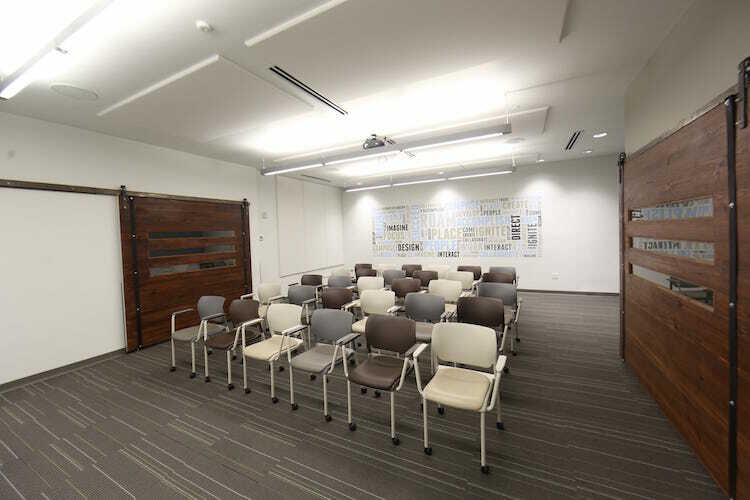 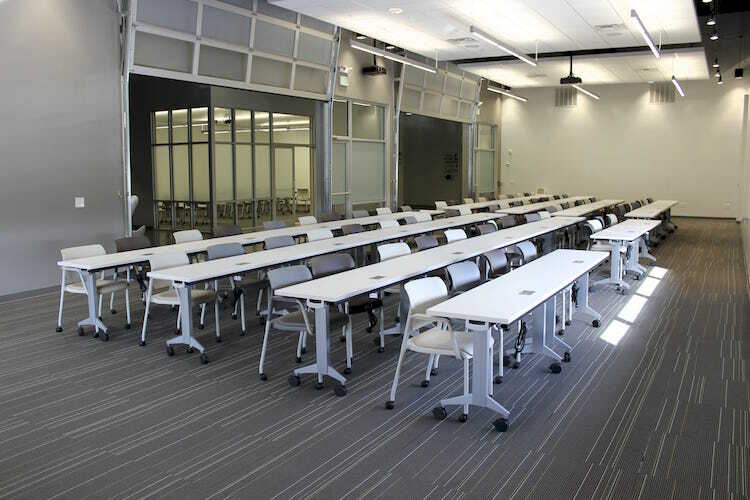 Designed to allow for customizable seating arrangements, the Garage is Roam Dunwoody’s largest meeting room and can comfortably accommodate a variety of large gatherings and company events. 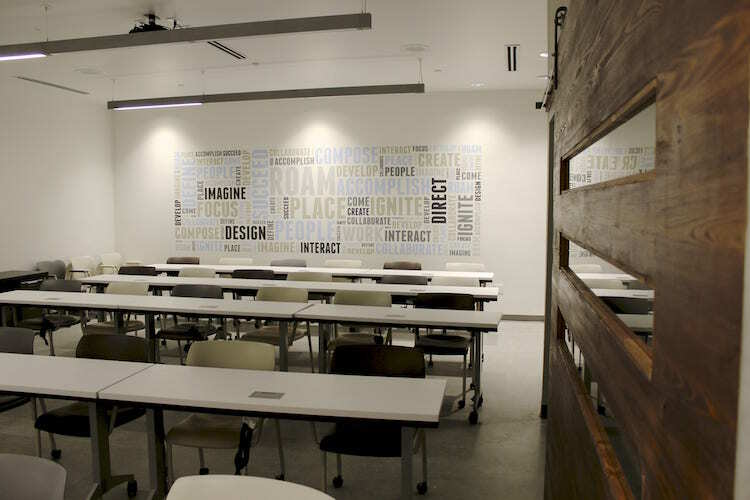 An inspiration word cloud and two sliding barn doors enhance this training room designed for productivity, innovation and collaboration. 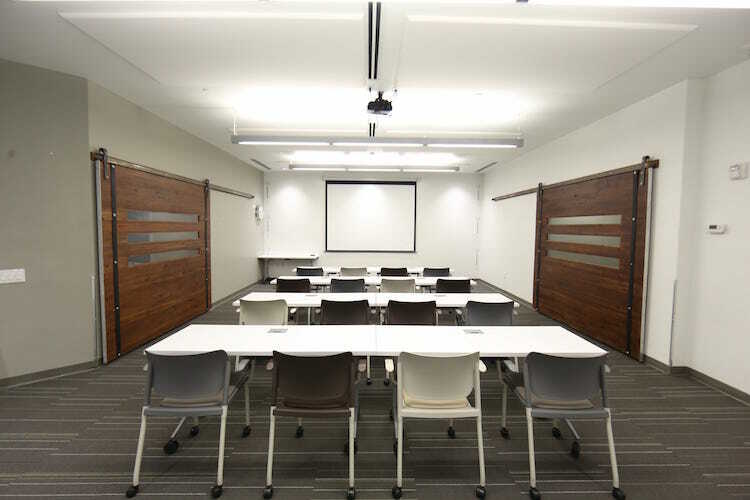 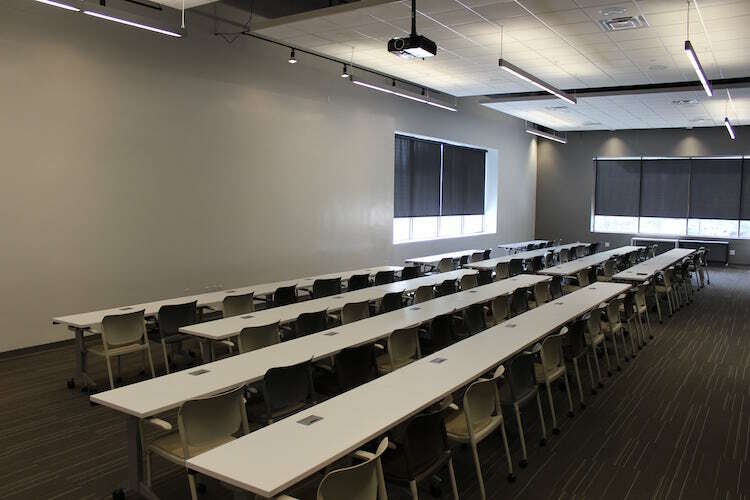 Perfect for department meetings and business presentations, the Forum can be customized to accommodate your unique meeting needs. 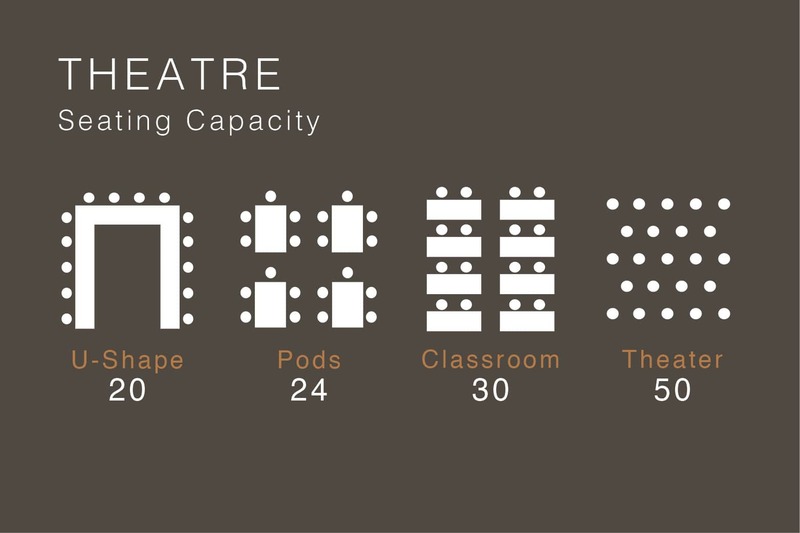 Designed as a blank canvas to allow for brainstorming, ideation and customization, the Theatre is an ideal meeting space for seminars, training workshops and strategy sessions. 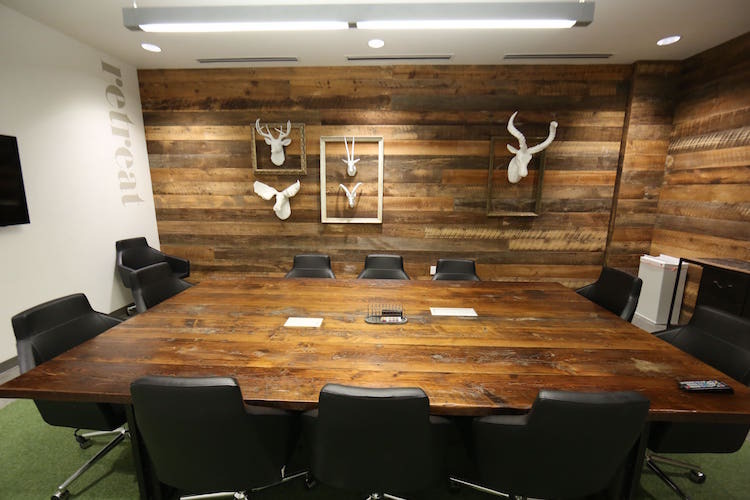 Retreat from ordinary conference rooms and impress clients and coworkers with a unique, outdoor-inspired meeting experience. 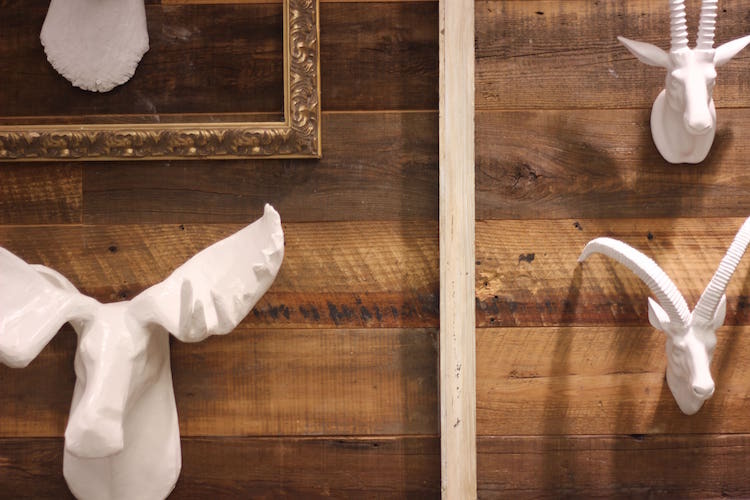 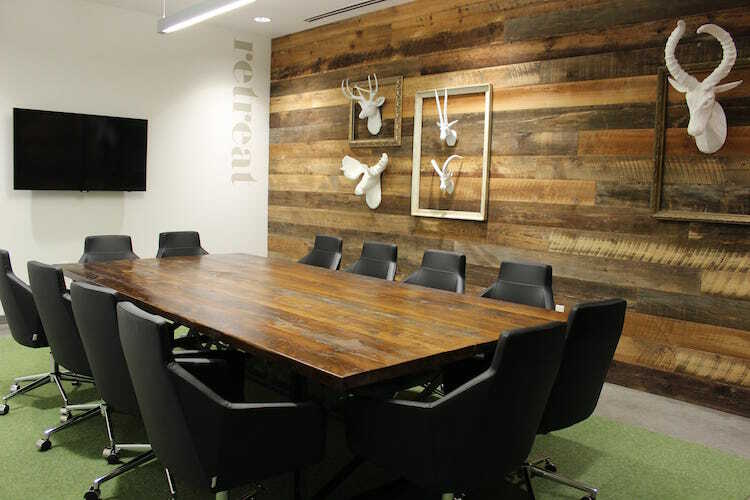 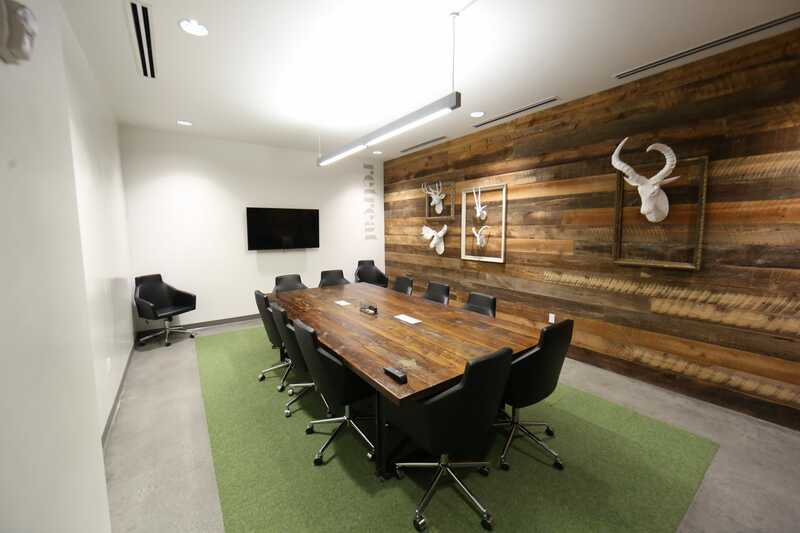 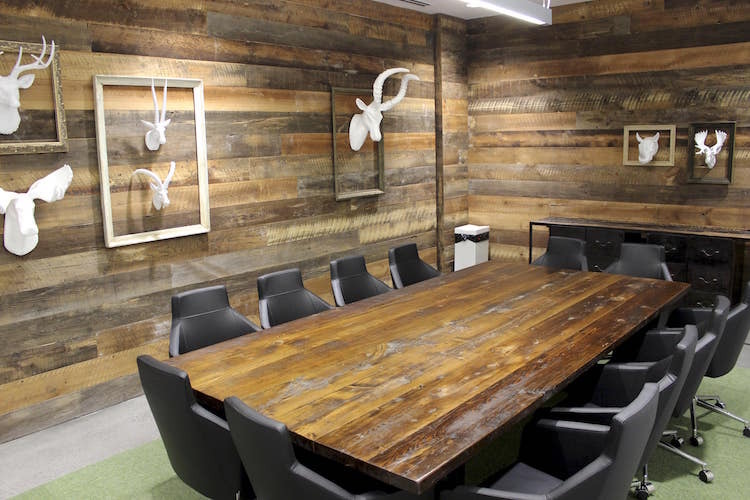 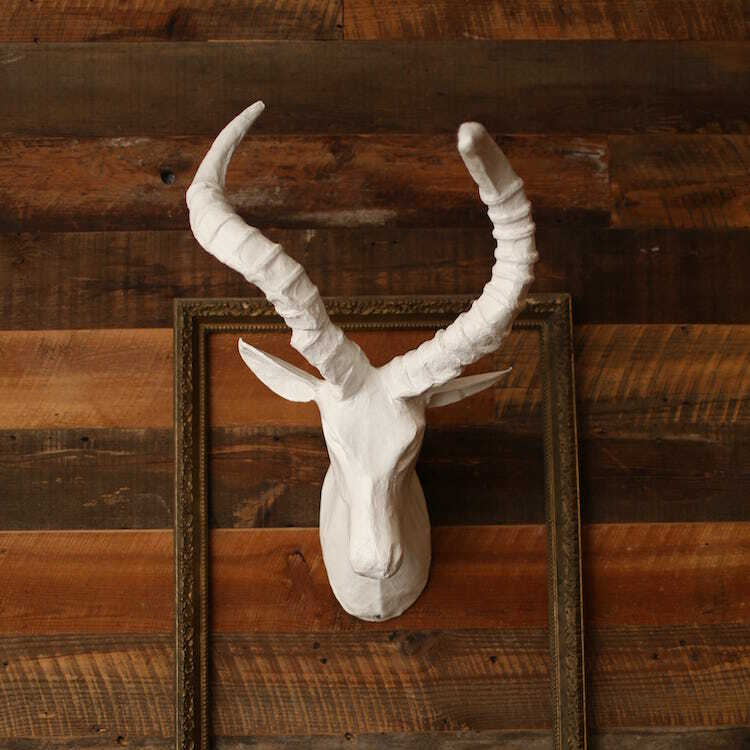 Featuring a rustic, wood table and mounted animal decor, the Retreat is an ideal meeting space for board presentations and investor pitches. 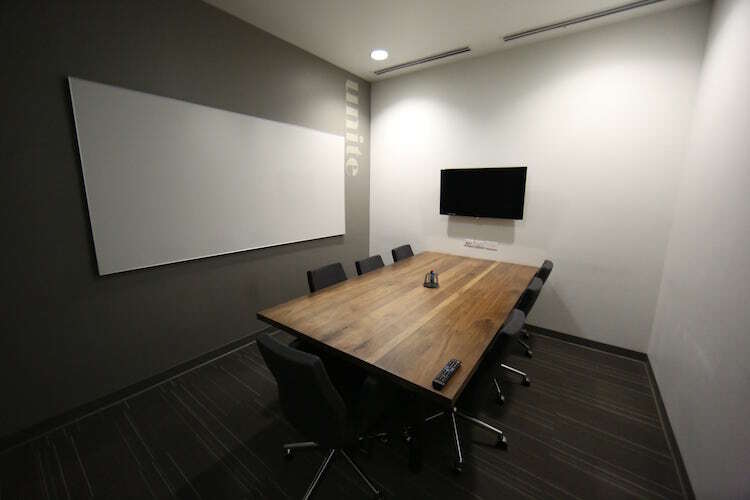 Enhanced with three whiteboard walls and a dry-erase table, the Lab is a sleek and polished meeting room designed to stimulate creativity and idea generation. 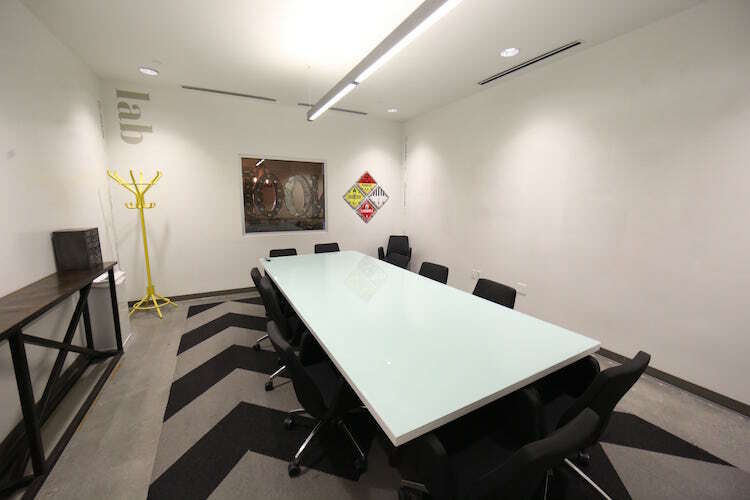 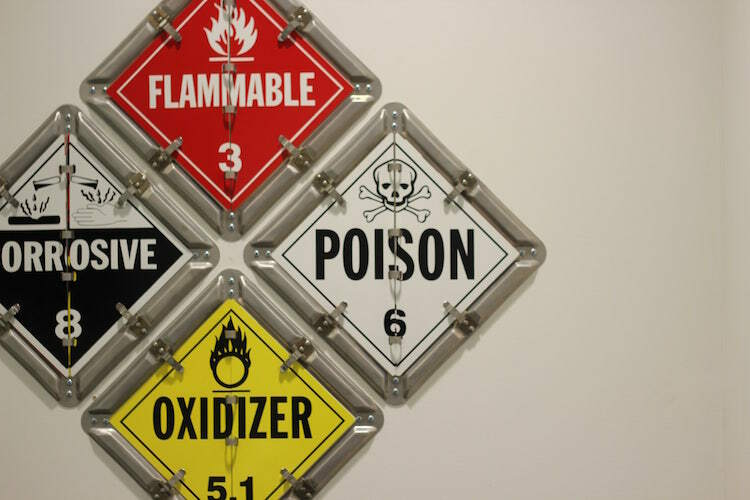 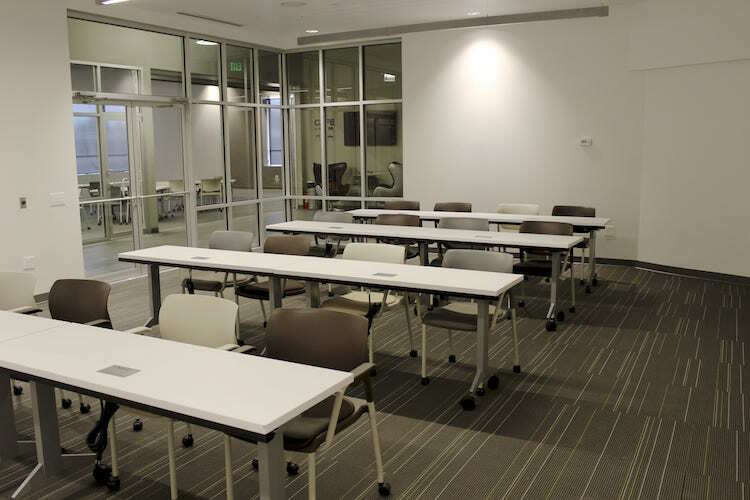 The Lab accommodates up to 12 people, and is an ideal meeting place for brainstorming sessions and strategizing meetings. 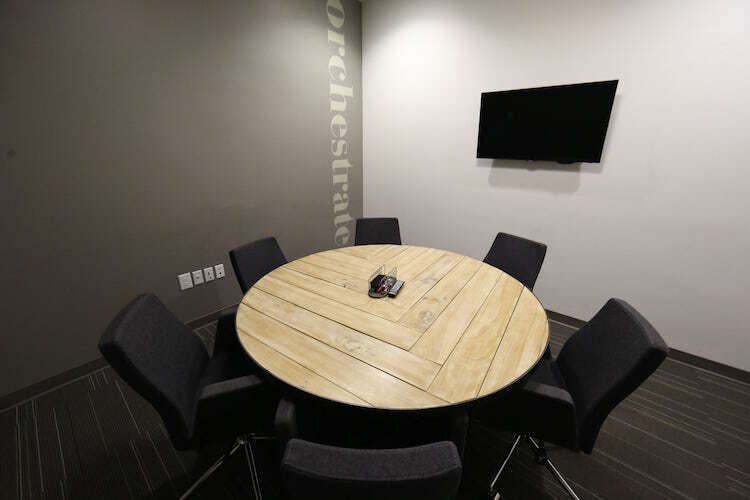 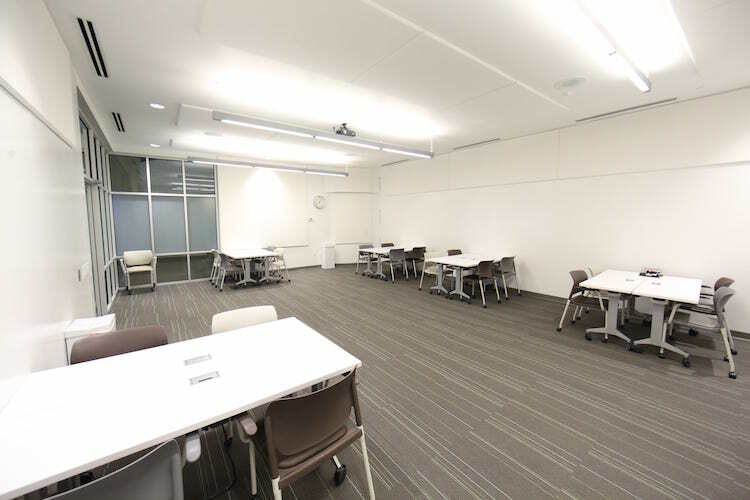 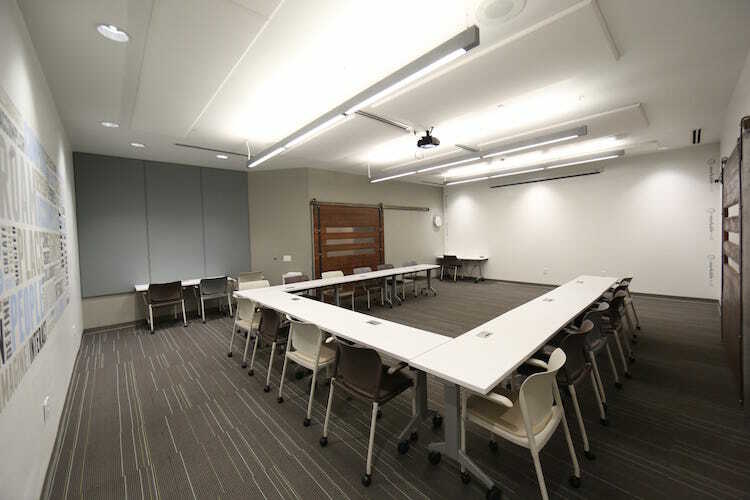 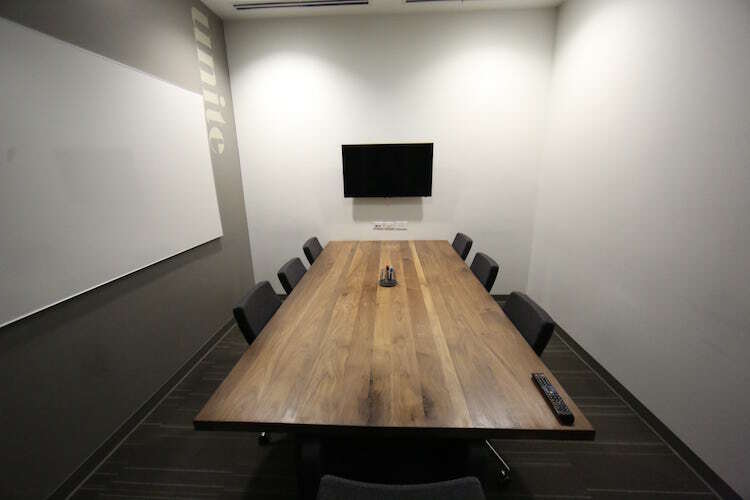 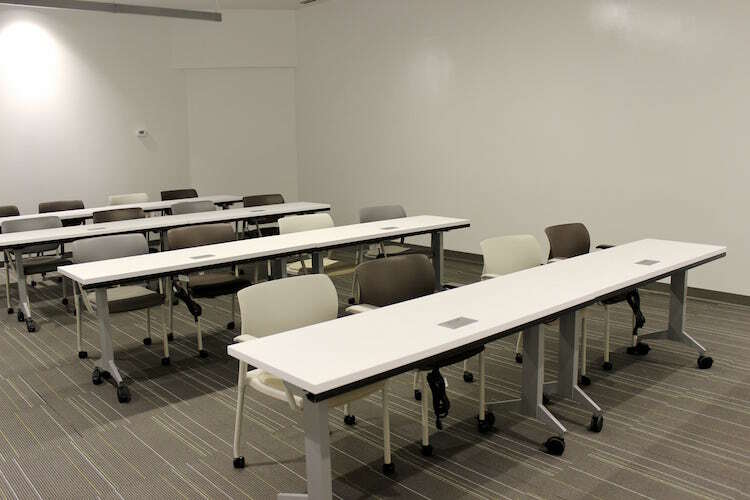 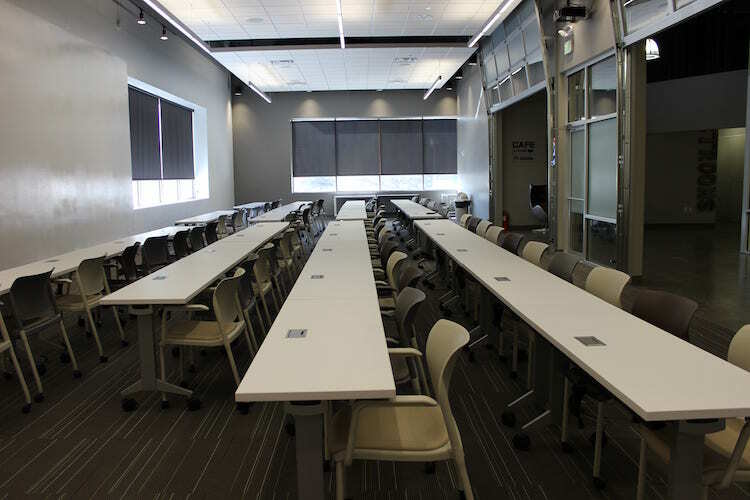 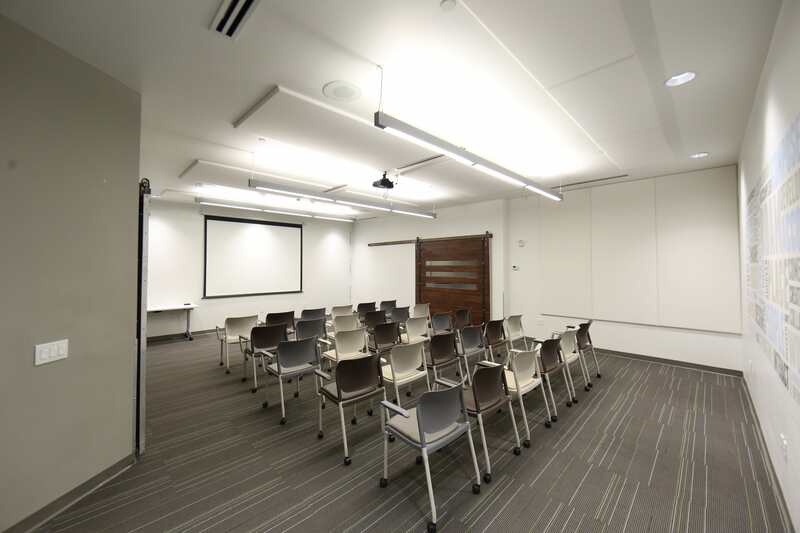 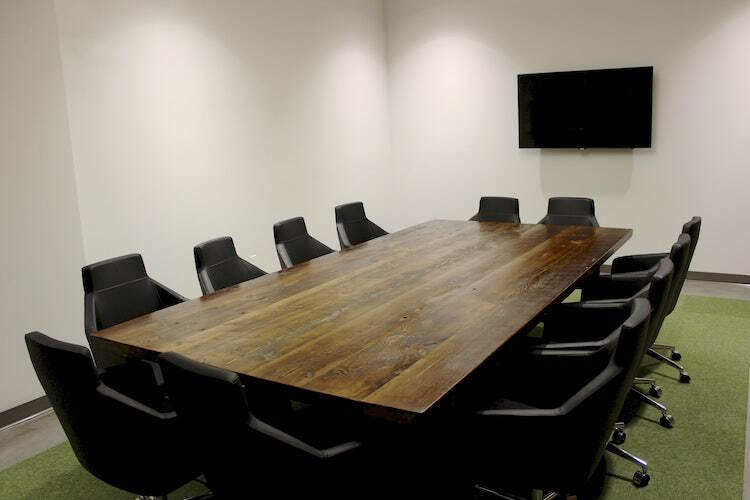 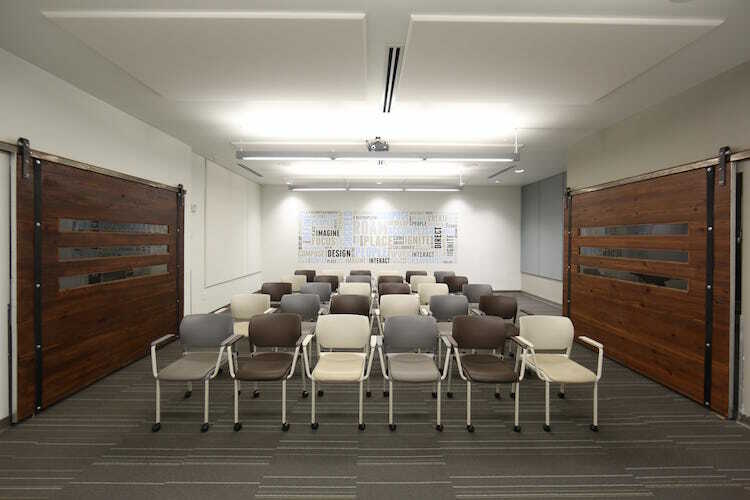 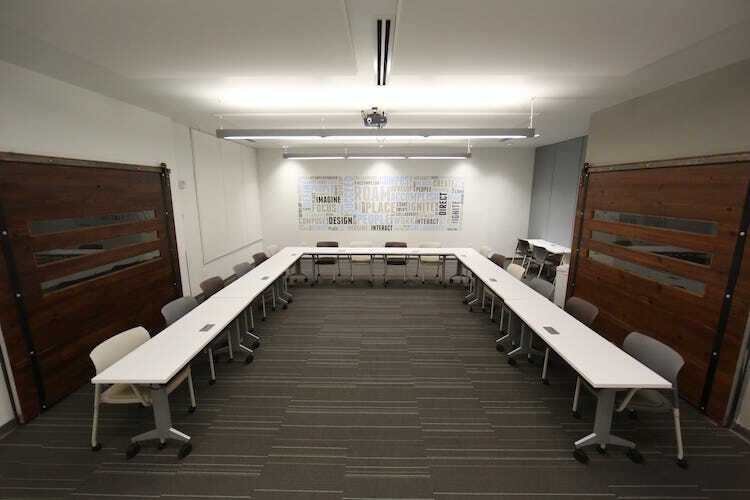 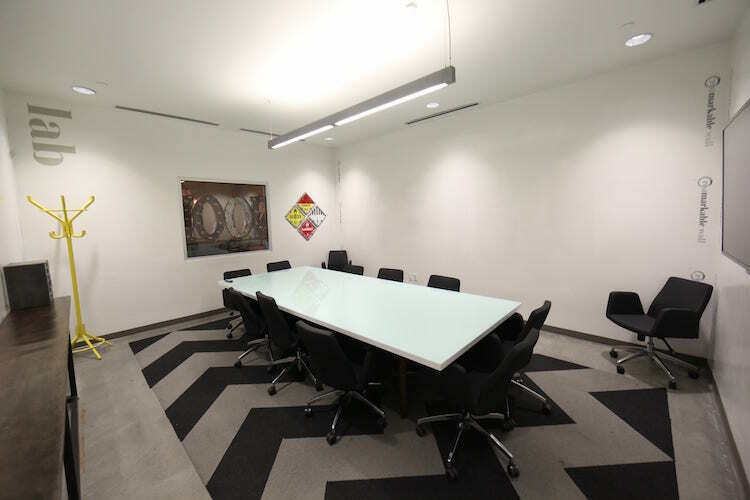 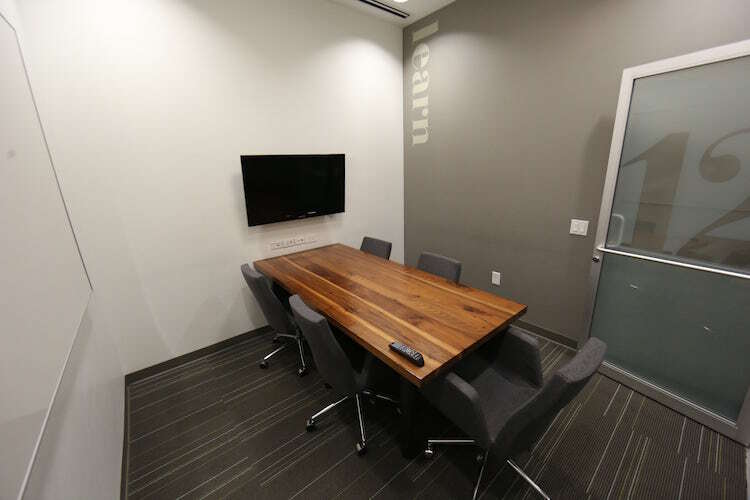 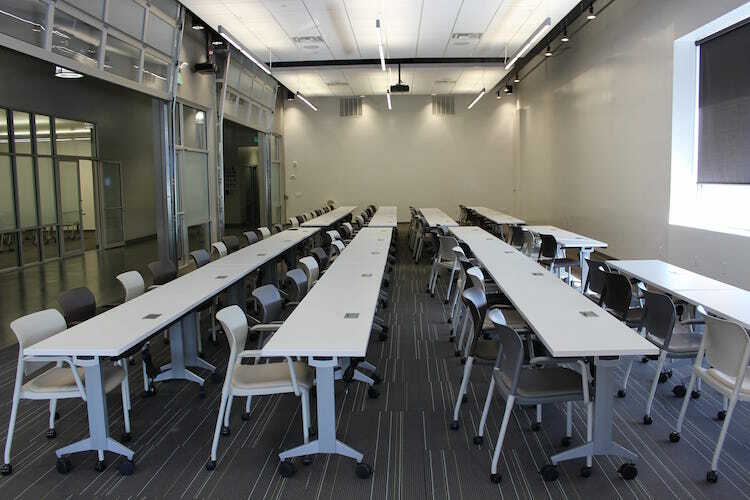 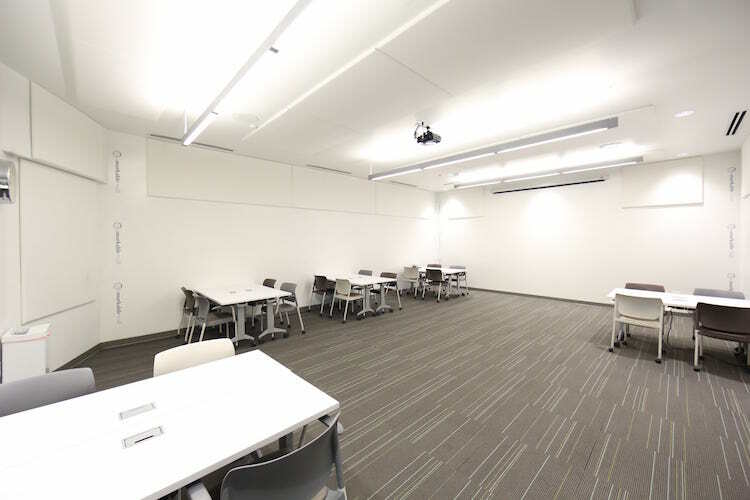 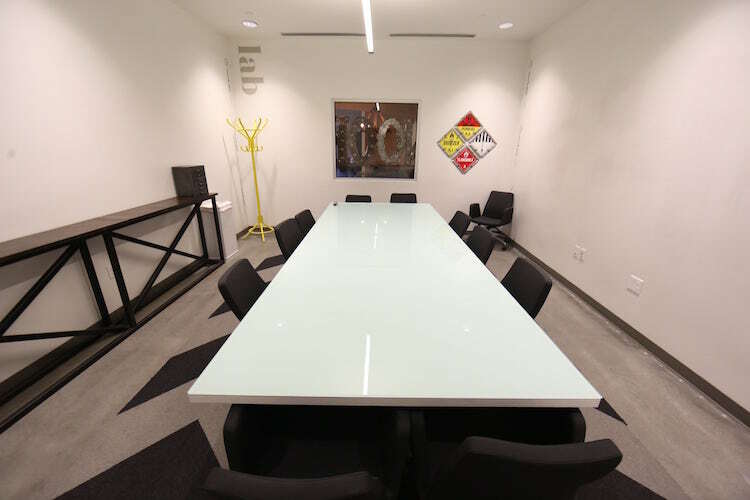 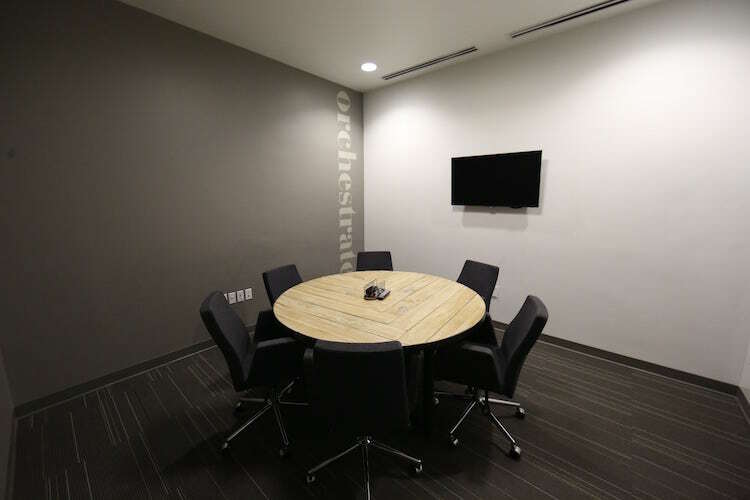 Unite your team for a collaborative work day or project meeting in this medium conference room seating eight people. 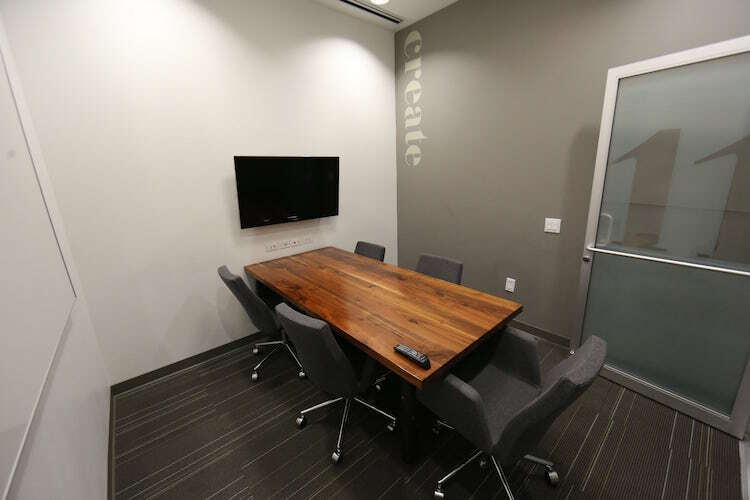 Experience enhanced team engagement and collaboration while working around a circle table in this innovative conference room. 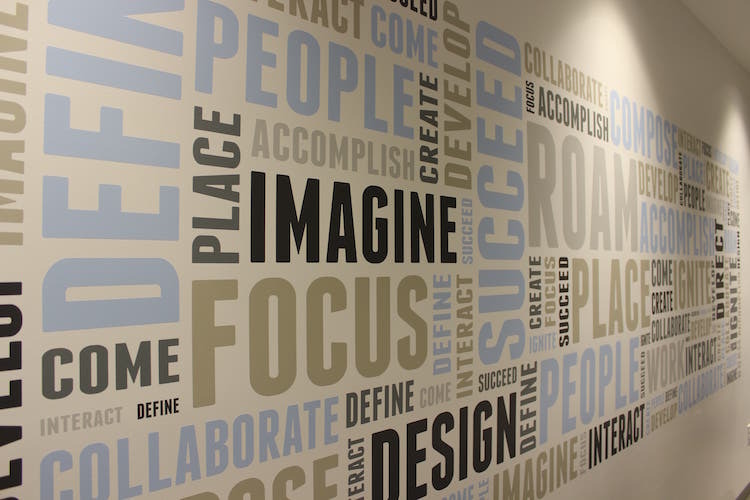 One of business’ key pillars is to look for opportunities that involve learning and honing your skills. 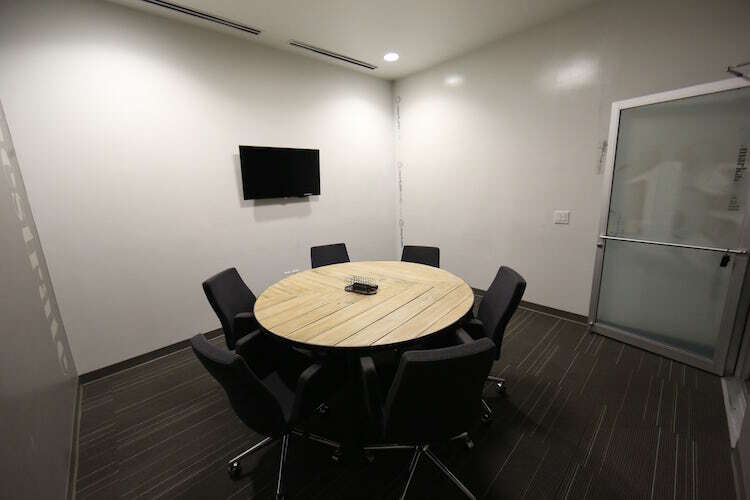 When planning to meet with your executive coach or consultant, experience the benefits of working in this small conference room. 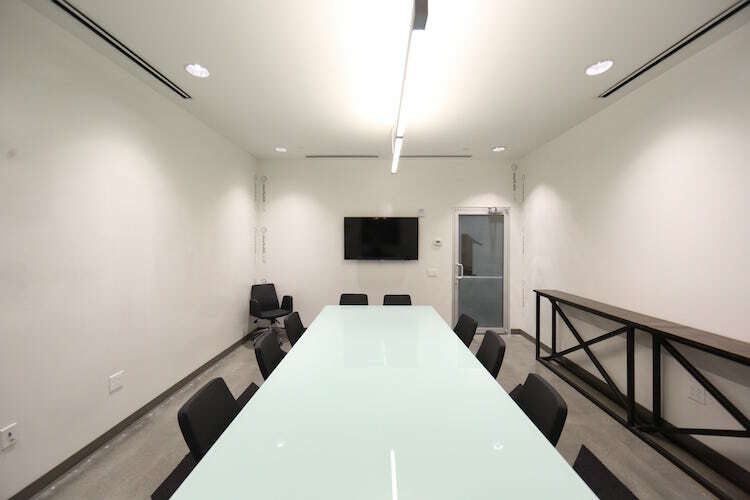 Whether you’re creating a marketing campaign for a new product launch or a business proposal for an upcoming investor meeting, experience enhanced productivity while working in this conference room. 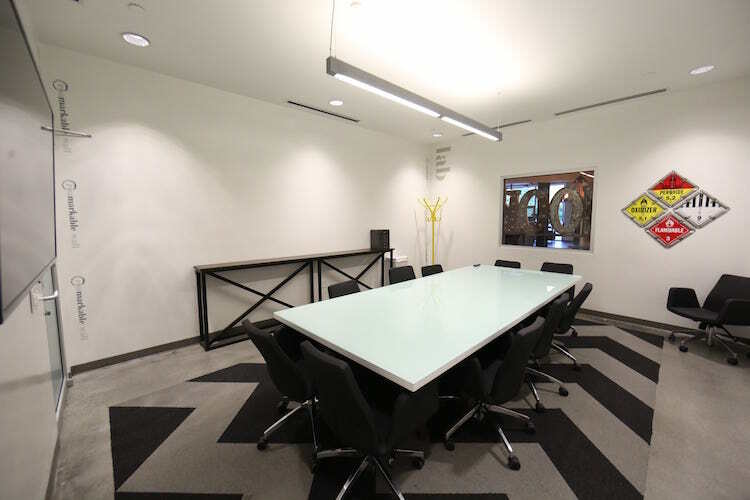 In need of a quiet place for a client consultation or video conference call? 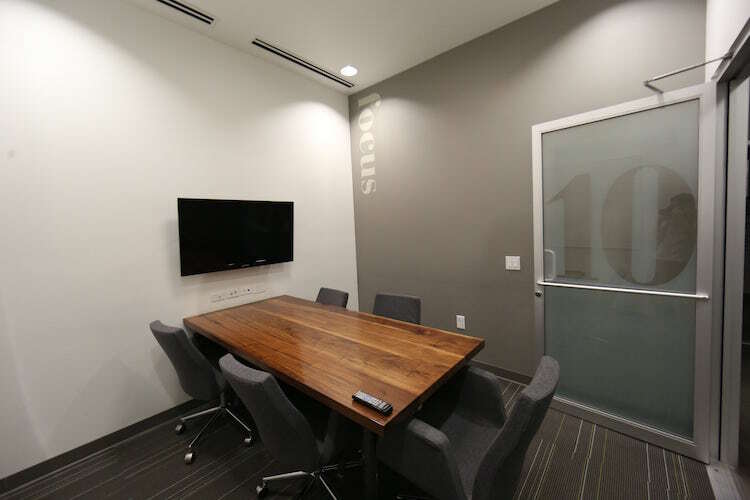 Stay focused in our small meeting rooms.